As I lay in the sun today absorbing the higher dimensional rays from the Sun, I invited my Higher Self (HS) into all areas of my life. I asked my Higher Self to join me in all areas….my personal space, my home, to share all that I am…to share my mind, to enlighten me with higher dimensional concepts for my higher self is wise, and has a stronger connection to Source and the Higher Dimensions….I asked my HS to assist me in vibrating to a higher frequency of light and freeing me from all negative emotions…in awakening and expanding my talents, in assisting me with the finishing of all my creative projects, in my relationships with other people and all of my interactions with the world. I asked my HS to share my life, to come into my lower self’s life to assist in the expanding of my awareness and consciousness to match that of my HS so that we may meet each other somewhere in the middle and begin to co-create this life together and then on a higher level, to co-create the new earth together……to assist in the co-creation of the new earth, to assist in the raising of my individual consciousness to the higher dimensions, and the mass consciousness to the higher dimensions for we are All One….and in the raising of our consciousness we assist All Others as we are All Connected in One Mind. There is a Higher Mind, a Higher Self that is an Oversoul for all of humanity on Earth. This Oversoul is an expression of Source. As an analogy or metaphor, it is like a gigantic shower head that has millions of tiny holes…the main Source of Life (or water in the analogy) comes through the main shaft, and through the shower head with millions of points of light shooting out and coming forth….that is what we all are, is shining points of Creator Source expressing itself. 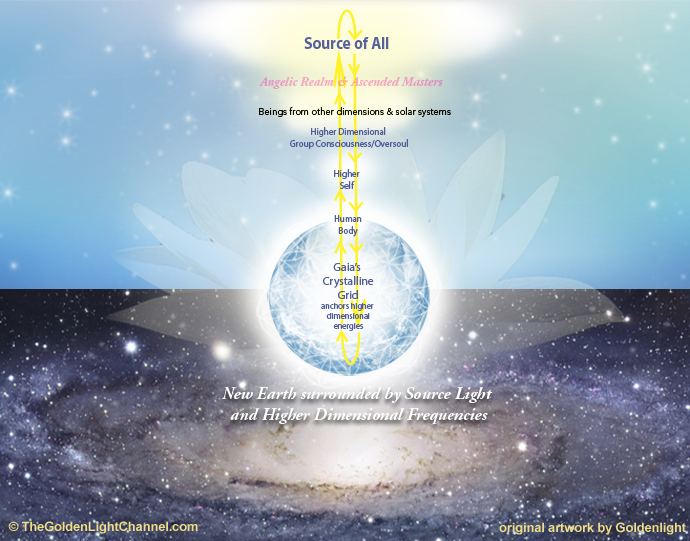 Each person has a higher self and if you look at a diagram such as this illustration above, your lower dimensional human self is connected to a higher self which is connected to an Oversoul surrounded by the Angelic Realm and the Ascended Masters surrounded by many Beings from other dimensions and other Star Systems….All connected to Source, all at different stages of evolution and consciousness. There is now occurring a unification of these points of consciousness so that all may unify into a harmonization of Creator Source light expressing Itself. And we would like to assist you during this Merkaba Astrological Higher Dimensional Construct, this opening of pathways to the higher dimensions in the removal even further of the veil between dimensions so that you may begin in earnest to elevate yourselves to the higher dimensions. This elevation occurs through unification with your Higher Self. We ask that you take five minutes within the next few days to sit in silence, connect in with your higher self by closing your eyes and stating “I connect with my HS, please connect with me” and this is how you then connect with your higher self. You are then connected (it is really that simple.) Because your HS cannot interfere in your life without your invitation or permission, you must invite this higher aspect of yourself into your life. You can visualize and feel this connection. It brings a higher awareness to the mind. You can feel the connection….We then ask that you invite your HS into all areas of your life. If you are comfortable at this time in asking, ask your higher self to reunite with you so that it may assist you in your ascension to the higher dimensions which are an Open Door at this time. Your HS will gladly come in and assist you in bringing yourself to a higher level of consciousness. It only has to be asked as it cannot interfere in your life without your invitation…once you invite your higher self into your life, amazing things will begin to happen. This Channel (Goldenlight) has asked and invited her HS into her life today. There was a coming together of the lower and higher selves for her, which will assist her in all areas of her life, creatively, financially, socially, mentally, physically, and on a higher dimensional level, and the same will happen for you. This reunification of her selves then begins to re-birth or re-form into a higher dimensional or multidimensional self. These encodings and instructions can be received from the Sun. When the Channel went out into the Sun today, she immediately began to download these encodings and instructions for inviting in her higher self to assist her with her ascension. This is available to you as well. We ask that you take the time within the next few days to go outside, sit in the sun, connect with your higher self, and if you wish, and if you are ready, invite and ask your higher self to come into your life. Invite your higher self into your life to assist you in all areas, to lift you up out of the former third dimensional vibration to a higher vibrational level that will assist you in ascending to the higher dimensions and in cocreating the new earth. We are always here for you, and we love you. We are your Council of Angels. We love you all.